The recently finished Australian tour of India ended with its fair share of action and excitement. Could Australia chase down such a mammoth lead? With such a long batting order anything was possible. However as the top order began to throw their wickets away – one by one – one got the sense that this Australian team had little idea what it was doing, which really was the theme of the ill fated tour. It all started earlier in the year with the handling of the Andrew Symonds incident. Punished for missing a team meeting he had no idea about, the Australian cricketing establishment ruthlessly cut him out of its inner circle. It doesn?t matter whether it was a Michael Clarke powerplay or just the misguided notion that him being sidelined would be better for the Australian team, the whole issue was handled atrociously and as a result, Australia would be beginning the hardest task in world cricket without one of its hardest competitors. Fast forward to the second last day of the series. It was without a doubt the sporting meltdown of the year. Australia had rallied strongly against the Indians and despite looking like the second best side all tour, an Indian middle order collapse had shifted the momentum towards Australia and there was a real possibility that they would be able to square the series. 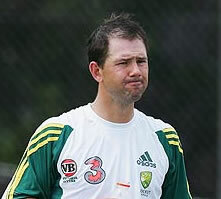 However, faced with the prospect of suspension for the upcoming Test series against New Zealand due to Australia’s poor over rates, the touring captain, Ricky Ponting, chose to play part time bowlers instead of driving home the advantage with the use of his specialist fast men. With that one decision he threw away the possibility of drawing the series. Had the series been drawn, it would have been one of Australian Cricket’s proudest moments in recent times. Now it seems destined to be the low point of the era. Throughout the tour it was difficult to follow the logic behind many of the decisions by team management. Why was Brett Lee not made aware of the decision to deny him the ball until only after the players had taken the field in Mohali? Why was Cameron White continuously picked despite being little more then a glorified specialist number eight batsmen? Why does Doug Bollinger continue to miss out despite having one of the best claims to a Baggy Green in the country, in Indian conditions. The fact that Stuart Clark was dropped from the final Test proved what many had suspected all along, the wheels had come off. It is highly unlikely that any proper backlash will occur. Australia’s glaring incompetence of the last month will probably be swept under the carpet and the heavy loss attributed to the retirements of key players. All will be forgotten come the New Zealand series and if, as predicted, Australia easily account for their rebuilding trans-Tasman rivals, their genius will once more be lauded. However the fact will always remain, they had the chance to stand up to India on their home turf and they systematically threw it away.